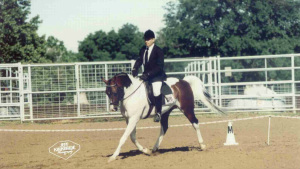 With limited showing "RT has PtHA World Championship wins in Dressage and Hunt Seat English Pleasure, and is a PtHA Champion. He is producing elegant athletic foals who will win your heart and win for you. Everyone lives a Cinderella story and Oshquah's story had just those elements. He was born in the Piney Woods of East Texas, bred and raised by Mimi Hoppe Wolf. A local cowboy broke the young stallion to ride and rode him down the roads and around Nacogdoches. A chance meeting at a horse show between Mimi and trainers Dan & Kathy Marcum signaled a change in direction, a partnership was formed and Oshquah traveled to Kirbyville to begin training for a show career. Dan & Kathy like to call Oshquah their " claim to fame", as he amassed an amazing show record with the Pinto Horse Association- 11National/World Championships, 20 Reserve Championships, High Point Pleasure Type Horse 4x at the National/World PtHA Show, plus Championships at Call A Arabian shows. He passed hos wonderful disposition to most of his sons and daughters and many of them continure his winning ways in the show ring. Sadly, Oshquah was diagnosed with squamous cell cancer and passed away in 2011 when treatments failed to stop the cancer from spreading.